The last month has been a busy time trying to get the F101 more exposure and working on links for our global distribution. For the TRIBE (those who have bought boats) then the F101 Whatsapp group is still our main way of sharing stories, technique and general encouragement for those that have bought, and are learning to foil, with F101’s. 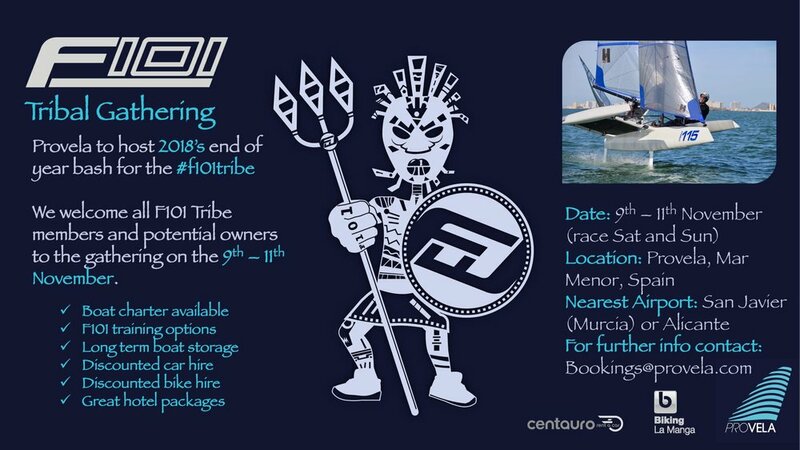 For those that are thinking of joining the TRIBE and owning an F101 these newsletters, that we are aiming to produce monthly, are our way of keeping you updated. Seahorse Magazine has run information and photos on the F101 in the October and November issue and we hope to get the editor, Andrew Hurst out on an F101 in Weymouth before the end of the year. The Foiling Experience Day we ran at Draycote was influenced by the wind gods, with only 100 mts. of foiling as the wind never arrived! Ironically as I write this we have a demo booked for someone flying in from Sweden at Weymouth and the forecast is gales! Mind you it also clashes with Weymouth Speed Week, so perhaps we should have known! Yachtsandyachting.com also ran an article on scoring options that we hope to introduce for the next Tribal Gathering in Mar Menor at the start of November. Read the full article via the link below. "A Time for Change! 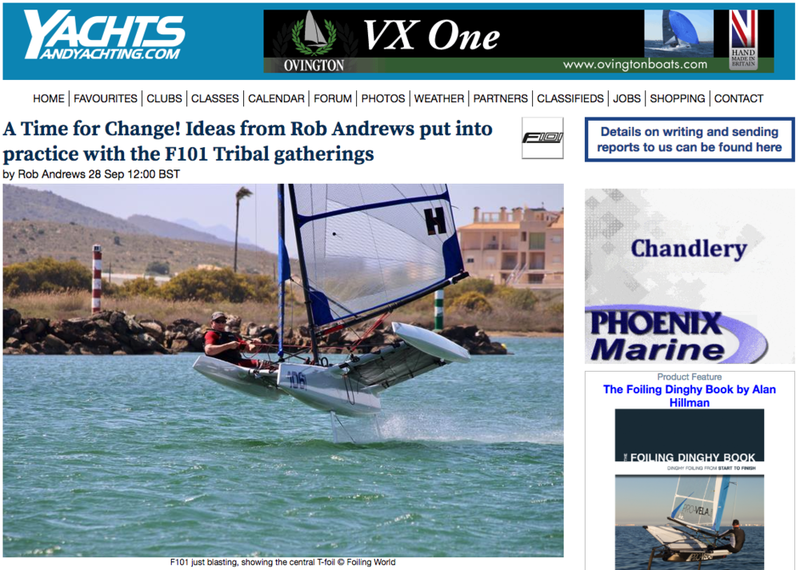 Ideas from Rob Andrews put into practice with the F101 Tribal gatherings." We are really excited by the next Tribal Gathering, with entries from USA, CAN, ITL, NED, ESP and GBR. The TRIBE will define how 2019 will work from an event perspective, so that we can deliver events that the owners actually want and will support. SCORING: where you can sail with a friend (Tribe option) and share a boat and still compete, or have a friend who just sails in one race (Joker Option) and all will compete against the Warrior options where you compete in every race. COURSES: the Tribe are still developing foiling skills and the courses will reflect this, aiming to progressively increase downwind gybing skills and also upwind foiling skills. Everyone is currently successful on a reach, now it's time to go deeper downwind, and as we do, we also want you to have the skills to foil back upwind. There will be plenty of tips for share amongst the Tribe. We have recently changed the position of the screw that holds the wand on – moving it from the front face to the side. This allows you to easily check the wand angle when the foil is in the boat by simply removing the wand to allow the wand arm to move. 45 degree of wand angle with an even amount of red and green bobble is the base measurement. To allow everyone to easily check this we have created a short video which is on the F101 You Tube page. We may also create a clip on template that sets the flap at the correct angle against the main foil. Now that the F101 has had all the production areas resolved with the help of the early adopters and founder TRIBE members, we are moving onto associated areas of the F101. The TRIBE should see the latest camera bracket at the Tribal Gathering. It consists of a new rudder pin, a carbon tube, camera bracket clamp (to fit Go-Pro and Garmin cameras) and two clips. Photos and feedback to follow in the next newsletter! We are also developing a new alloy trolley and box trailer. The aim being that the alloy trolley can either be used for car topping or as part of the box trailer. Inside the box trailer you can lock away fully fitted foils, beam, tramps and sails, with the hull and floats sitting on top, using the new alloy trolley. Simply roll the trolley onto the combination clamps that sit on top of the box. Photos and feedback as soon as we have a prototype, with emphasis on secure storage and fast pack-up and rigging. As we start to move the boats around we will also need trailing covers and we should have a prototype set built by HYDE at the Tribal gathering. The racing, the characters, the gossip! PLUS information on a unique opportunity to join the TRIBE through a refurbished F101.